Your wedding was everything you dreamed it would be, from the flowers to the decorations, and especially your dress. Whether it was a beaded, embroidered, silk family heirloom handed down from your grandmother or something you picked out for your special day, your dress is a treasure that deserves preservation and care. You might want to keep it for a daughter to wear or maybe just as a reminder of your special day. Whatever your reason for wanting to keep and preserve your wedding gown, here are some important steps to follow if you want to maintain your dress’s elegance for years to come with proper wedding dress storage. Step #1: Follow the care instructions on the label. Your wedding dress might need dry cleaning or may need to be professionally cleaned with a process involving water. Some polyester dresses might be hand washable, but you will want to try first washing an area that is not very big or noticeable to make sure. The label might also specify a type of detergent or cleaner that needs to be used. The store where you bought your gown may provide information on experienced cleaning professionals appropriate for your wedding dress. Choose a dry cleaner or other cleaning professional who already has experience with bridal dresses. Be aware of what kinds of chemicals will be used. If possible, look for a cleaner that uses non-recycled cleaning solution to avoid the chemical, dry-cleaned smell. Step #2: Clean your gown as soon as you can. Remove stains before they have a chance to set and also eliminate dirt before it affects the color of the dress. Step #3: Avoid storing your gown in plastic. Storing your dress in any kind of plastic—hanging garment containers, dry cleaning wrapping, etc.—is not a good idea. Plastic emits fumes that can discolor and damage your dress, as well as trap moisture which can cause the dress to mildew. Step #4: Decide if you want your wedding dress professionally stored (in a box or hanging bag), or if you want to do it yourself. A box is easier to store, while hanging your dress will cause fewer wrinkles and potentially less care later. If you are having a professional service preserve your wedding dress in a box, make sure they use a box that contain no acid. For added protection, make sure that the entire box is acid free, not just the coating of the cardboard. Any parts that could develop severe creases, such as the bodice and the skirt pleats, should be padded with acid free tissue paper. Use buffered tissue for man-made fabrics (polyester, etc. ), and non-buffered tissue for natural fabrics (silk, etc.). Do not seal a boxed gown because the gown should be rearranged every couple years to prevent permanent creasing or other damage. This also allows you to look at it, wear it every so often, and show it to your daughter! Place it in a bag made of cloth without dye and with a padded hanger. Reinforce narrow straps to ensure they don’t break. Fill the bodice with tissue made without acid, so that it will remain shaped just as it looked on the big day. Step #5: Look at the gown at least every year to spot problems. Maybe that stain was not noticeable at first, but it can become more apparent as time passes. Catching and treating the stain as soon as you find it is your best bet for wedding gown storage. Step #6: Wear plain cotton gloves when handling the dress. 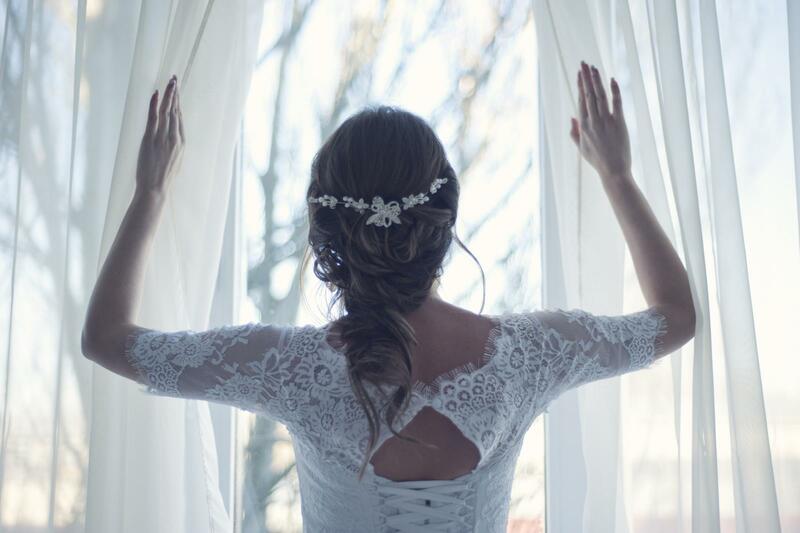 Even if you are just taking your wedding dress out for a short time, wearing gloves will help protect the dress from perspiration or other contaminants on your hands that can leave a residue. Perspiration can also make the cloth brittle. Step #7: For best results, remember to store your wedding garments someplace cool and dry. San Clemente Self Storage is located in a very mild climate which is ideal for storing most items. Come check out our beautiful facility and extensive security feature or call us at 949-366-1133. Wedding dresses are not alone at needing special care for storage. If you will be storing an appliance, check out the Storage Tips article on "Appliance Storage" for some guidance on storing large appliances in your storage unit.